The Chinese yuan recents high against the dollar – a puzzle for the FT? The renminbi has jumped to its highest level in nearly two decades against the dollar in a small burst of appreciation that caught many investors flat-footed. The Chinese currency has almost hit the upper limit of its daily trading band against the dollar on three consecutive days, a show of strength that appeared to be at odds with data pointing to a broad slowdown in the country’s economy. It is quite obvious that China has operated an exchange rate peg which the authorities did not change for many years (see that flat horizontal line?). It is also obvious that China has re-pegged the exchange rate during the financial crisis and recently abolished this peg. However, if you think that market forces – in- and outflows of capital – set the exchange rate you must be a fool. 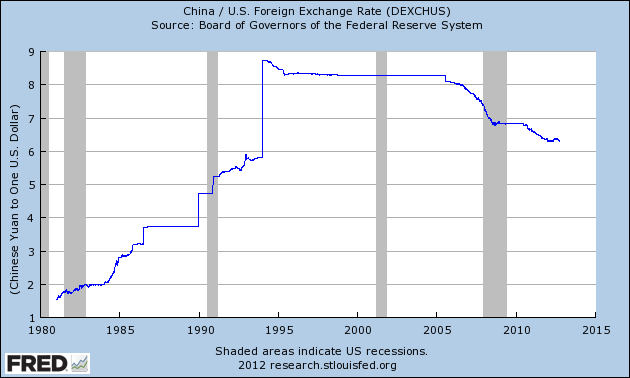 There is no causality running from economic growth of the Chinese economy to the exchange rate. The People’s Bank of China (PBoC) sets the exchange rate exactly where it wants it to be, either at a certain rate or in a certain band. The rate or bands can change whenever the PBoC wants them to change. As long as they have US-dollar assets at the PBoC they will be able to exchange yuan into US dollar for those that demand so and since they can print yuan exchange in the opposite direction is unlimited. This is International Economics 101 and not rocket science. Amazing to see how the myth that exchange rates – and very often, interest rates – are set on free markets in every single market on this planet lives on.